Abby the Librarian: AudioSynced September Roundup! AudioSynced! It's that sweet time of the month when we see what audiobooks have been reviewed all around the blogosphere. AudioSynced is a monthly roundup hosted by myself and Kelly of Stacked. Need ideas for what to listen to next? 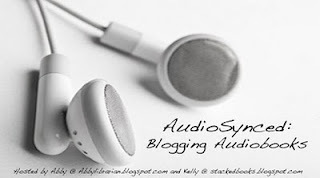 Check out the previous editions of AudioSynced! Em at Love YA Lit reviews Identical by Ellen Hopkins, narrated by Laura Flanagan. She says that the narrator "brings the characters to life, giving the twins contrasting voices and making their verses come across as extremely natural and everyday". Lee at Reading With My Ears reviews The Last Summer of the Death Warriors by Francisco X. Stork, read by Ryan Gesell and The Pale Blue Eye by Louis Bayard, narrated by Charles Leggett. Of Last Summer, Lee says, "Gesell... takes an interesting approach to the book's omniscient narrator, reading with a relaxed edge of humor that keeps the story from becoming maudlin." And of The Pale Blue Eye, "Leggett's narration left me breathless." Laura at Ramblings of a (Future) Librarian reviews Incarceron by Catherine Fischer, read by Kim Mai Guest. Jen at Devourer of Books reviews Kraken by China Mieville, read by John Lee. She says, "John Lee is a fantastic narrator and did a great job with this challenging title." Michelle at my books, my life reviews Anansi Boys by Neil Gaiman, read by Lenny Henry. She says, "I highly recommend listening to this one – you’ll be in for a treat." Over at Audiobook DJ, you'll find an audio review of Paul is Undead by Alan Goldsher, read by Simon Vance. Jess at The Joys of Reading reviews several audiobooks in her September Audiobook Roundup. She listened to Charles and Emma: The Darwins' Leap of Faith by Deborah Heiligman, read by Rosalyn Landor and I Am the Messenger by Markus Zusak, read by Marc Aden Gray, among others! And I squeaked in with a review of Liar by Justine Larbalestier, read by Channie Waites. Got another link for me? Put it in comments and I'll add it to the roundup!! Didn't review an audiobook this month? Never fear, Kelly will host another roundup at her blog Stacked on November 1. Until then, happy listening! !